This is the first thing I've baked in a few weeks. With the trip to Vegas and just the general craziness of leaving and coming back, I haven't felt up to it. But more than that I haven't really felt inspired by anything. I see things that I want to bake, but nothing that makes me want to turn off my TV and move into the kitchen. 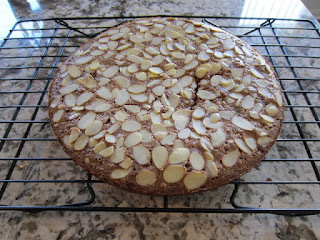 That all changed when I saw a recipe for a chocolate buckwheat cake the other day. I'm not sure why, but images of a Toblerone cake began dancing in my head. First and foremost I wanted this cake to exemplify the flavours that make up a Toblerone. This was made easy as the recipe included almond meal from the start. The only problem is that almond meal and buckwheat flour are not things that I normally (or ever) have on hand. I chose to make the almond meal and swap the buckwheat flour for all purpose. However, the biggest change I made was to remove all of the sugar to clear room for the added sweetness of the Toblerone. The batter ended up being really runny, runnier than I had expected (and I expected it to be runny). As a precaution I tossed another quarter cup of flour to thicken it up. To finish I topped the cake with almond slices. Partially to add a little more almond flavour and some texture variance but also because it made it look nice. Baking with milk chocolate is always strange. Perhaps it's the recipes I have chosen to use, or more likely the chocolate I'm using. First, it always bubbles, like a lot. Second, more often than not half way through baking a giant bubble will begin to form. I will literally turn away for a minute and when I turn back it looks like something is trying to crawl its way up from the bottom of the pan. This time it was no less true, but when the cake was done it looked pretty good and actually got me excited to eat. However, I was making no promises as to the quality of the flavour. I knew better. I mean there's nothing paticularly wrong with the cake, but it won't blow your mind. It's quite light on flavour. You can taste the milk chocolate but it's super mellow; granted this is not necessarily bad because it pairs well with the relatively mild almond flavour. Unsurprisingly it's also only subtly sweet. The texture is interesting. I'm not sure exactly how to describe it. It's not exactly a brownie, or fudge, or custard. Maybe it's its own thing. 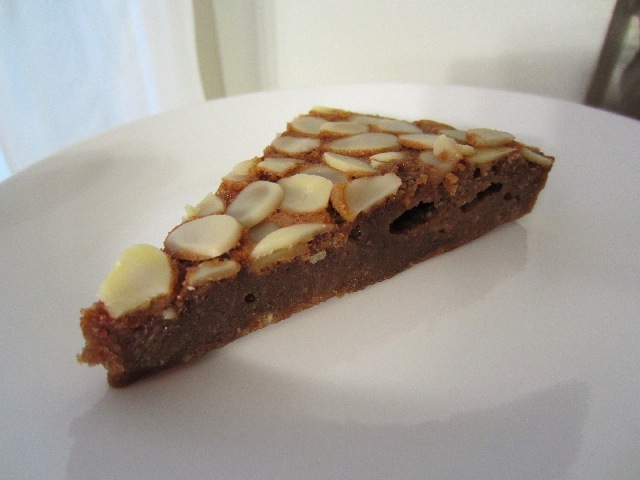 And I'm quite happy that I topped it with the almonds, it did exactly what I wanted, enhancing the flavour and adding some texture variance. Overall, I'm happy with the cake's flavour, I just wish there was a little more of it. Yet all of these faint (perhaps delicate?) flavours along with the texture make the cake oddly addictive. I can't figure it out :). Strangely I'm more curious about returning to this recipe then many that I've done in the past. Maybe because I'm so conflicted. I really just want more impact to the flavour. Removing some of the butter would be a good first step. I think all that butter fat only serves to further mute the flavours of the milk chocolate. I also might forgo the extra flour. I'm really conflicted. So conflicted that I don't know how to end this post. I will say that my mother really enjoyed the cake. Although sometimes her opinions are a bit suspect :). Preheat oven to 350F. Grease a 9" round cake pan line the bottom with parchment paper and grease paper. In a spice grinder or food processor add almonds and sugar and grind until fine. In the bowl of a mixer beat eggs and salt until eggs are super frothy. -- The original recipe says 5 to 9 minutes, but this included sugar so it might not be necessary as there is only so much air you can incorporate without it. But I went for the full 9 anyways. Add chocolate to eggs and gently stir together. Allow to cool in pan on rack for 5 minutes before removing to cool completely. Definitely a stronger chocolate would help the flavour, the original recipe uses bittersweet, but I would really like the milk chocolate flavour to come through. A higher quality pure milk chocolate might be a good start. I think the problem with the butter is the amount more than the flavour. Milk chocolate is already a pretty mild flavour, and I think all the extra fat kind of "waters it down". I'm really considering revisiting this recipe this weekend, but I'm not going to say that outright :). And thanks for the compliment on the looks :). I'll take some of the credit from the almonds :). It looks great Adam! I'm glad to hear that the Giant Toblerone has given you 'food for thought' in regards to interesting recipes. I'm looking forward to hearing what else you can do with it.